Curtis Harrison readies a pass during a pre-league game Sept. 9. Photo by Doug Landrum. Early this season, the Breakers football squad was struggling with their special teams, specifically their punt team. After player Curtis Harrison was reassigned to the team, the problems evaporated, reported coach John Shanahan. Harrison also plays on the defensive team and will start in this week’s game against Costa Mesa, Friday, Oct. 14. He has thrown close to 1,000 yards as the team’s starting quarterback, according to the website Maxpreps.com. Laguna Beach High School football coach John Shanahan described Harrison as a standout player. “In the weight room, on the field, no one works harder,” said Shanahan. The junior’s skills are still improving. “It’s been a huge learning process,” said Shanahan, who later described Harrison as a grinder, a real hard worker. “He listens, and really wants to please,” the coach said. 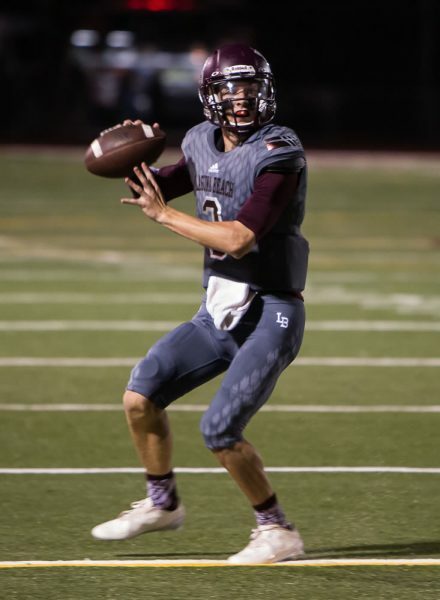 Jack Simon, an LBHS graduate and last year’s starting quarterback, described Harrison as a strong leader and key offensive player who ably stepped into his cleats. “I think he has exceeded all the expectations that he had and everyone else had for him,” said Simon, now at University of Massachusetts in Boston and playing baseball. Harrison has thrown 10 touchdowns this season and has averaged about 170 yards a game with only two interceptions thus far. Though injuries have weakened the team roster, Harrison has so far remained unshakable. Even amid football practice with his peers watching, Harrison, remained measured and relaxed. Surprisingly, football was not Harrison’s first sport. “I used to play baseball like my older brothers, but after a while I decided to stick to football,” said Harrison. And with that, Harrison rejoined his teammates to prepare for the upcoming game.